The Eco build is GO! 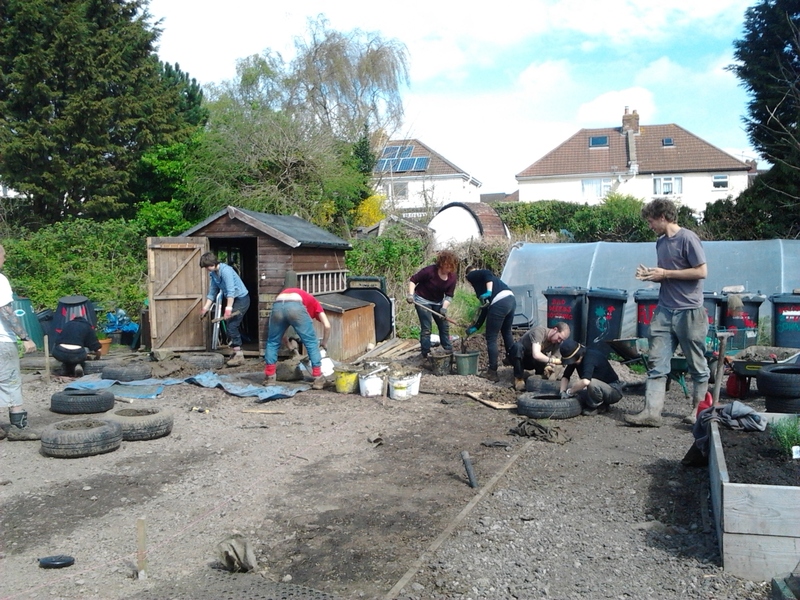 Yup we’ve REALLY started now, drainage for the foundations put in and last Wednesday the garden was a hive of activity as our Wednesday regulars and some lovely new faces started stuffing the tires that will raise our floor off the ground. It was a great day! A huge omelette was shared, and glory be, suntan lotion was necessary!! 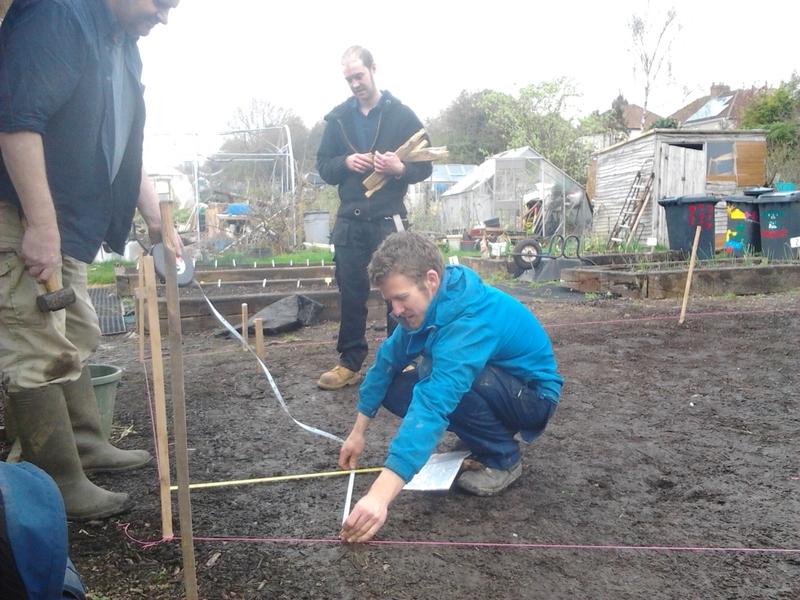 Nico has also assembled a team of ace volunteers who are beavering away on other days. Pretty exciting,eh? Wish you could get involved but can’t make it down on a Wednesday, eh?… No worries!! 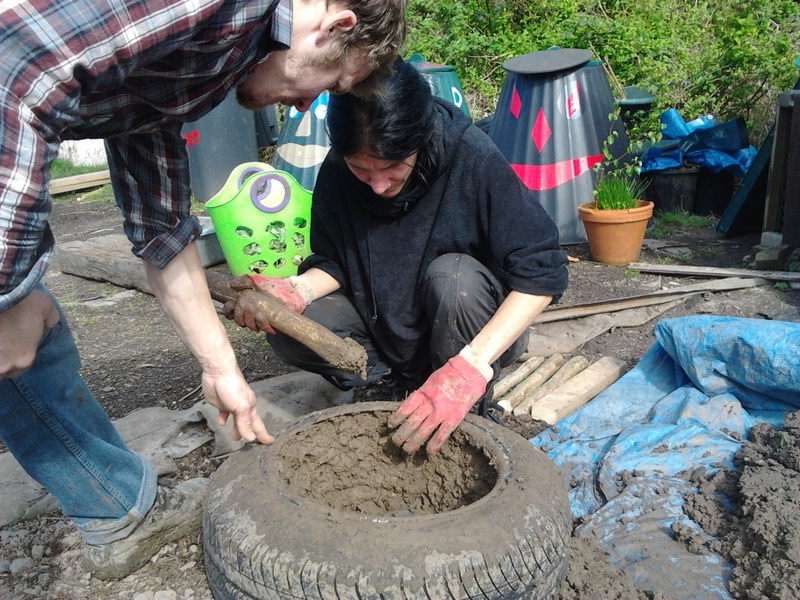 We’ll be doing the most exciting bit and raising the straw bale walls on the sunny weekend April 26th/27th 10-4 so come and get involved there’ll be food but bring more! 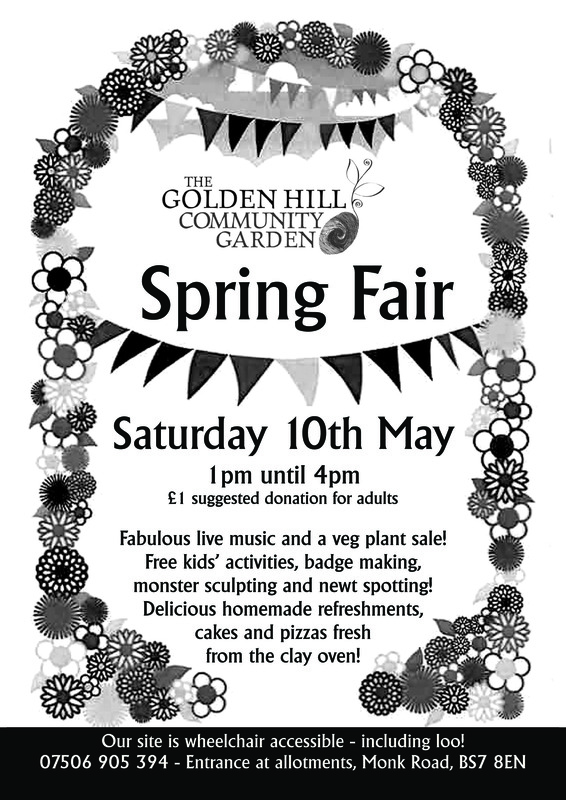 And the next big date for the diary is May 10th 1-4 our Big Spring Fair. Yup it’s that time again. Soooo people your community garden needs you!! This is our biggest fundraising event of the year please please volunteer to beforehand to put up posters, deliver flyers on your street, bake us a cake, donate plants. And come help on the day with set up or tidy up on the day, or give an hour doing something super fun on the day to make it special!! We’ll have a plant sale, cake stall, free kids activities’ – badge making, clay monster sculpting, pond dipping and facepainting and fabulous live music and fire up the frog for pizzas BUT only if you guys help make it happen!! So if you’re happy to give a hour of time on the day AND get a free slice of cake for your trouble AND the warm glow of being part of one of lovely events. THEN LET ME KNOW!! Honestly an email that says you can help for an hour and you don’t mind what you do will make my day!! This entry was posted in News from the Garden on April 22, 2014 by GHCG. Funding and building and eggs and onions and good times. Well as of yesterday we are independent! The original £88 000 of lottery money given to Horfield and District Allotment Association is all spent and after smashing all the targets set to us. We’ve exceeded our wildest dreams in terms of numbers and participation and wild schemes and have not just created a community garden but a fabulous community of gardeners! We’ll now be looking for people who want to become members of the garden as per our new constitution with the proviso you have to want to come to our AGM in the summer and vote on stuff. More about this next time. And how was the first day on our own?…. LOVELY. 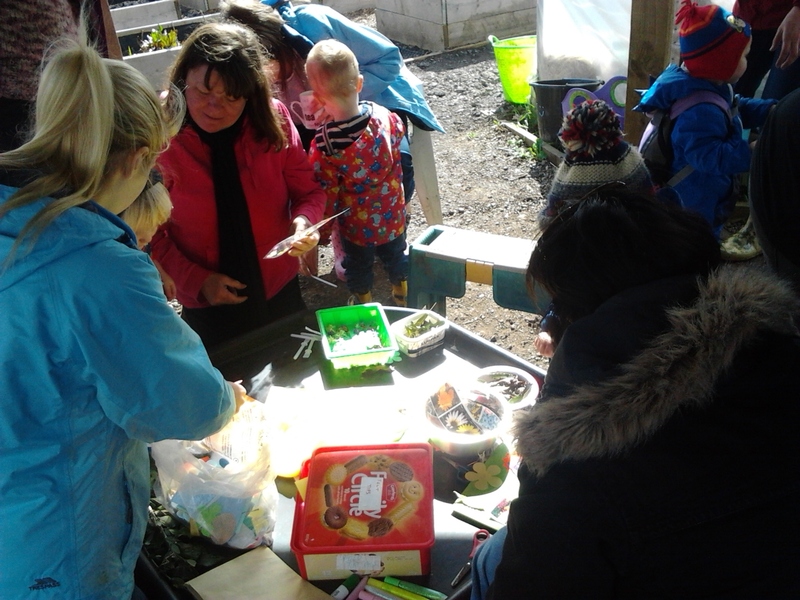 We enjoyed a fantastic Golden Buds toddler session in the sunshine. Then in the afternoon had a visit from one of our new Golden Groups – The Willows day care centre for adults with dementia. 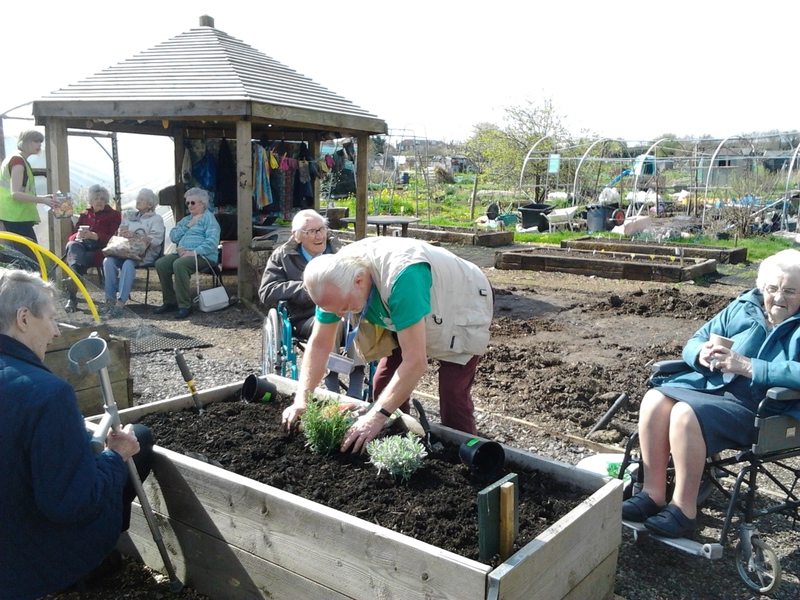 So we had folks from 18 months to over 80 years old enjoying the sun and getting their hands dirty. I think that’s a happy and auspicious start to our new found independence! AND I’m super excited say the eco build is GO! Our fabulous builder Nico was on site today getting it marked out and the digger is coming to dig the drainage trench the build will sit on, then we start filling tyres, then fast forward 8 weeks…. and we’ve got ourselves a beautiful straw bale build. We’ll be working on it on Wednesdays and some weekends. Whoop! And there’s so much other great stuff going on as well! We’ll be on site this Saturday 5th 10-2 where we’ll be reveling in the season! 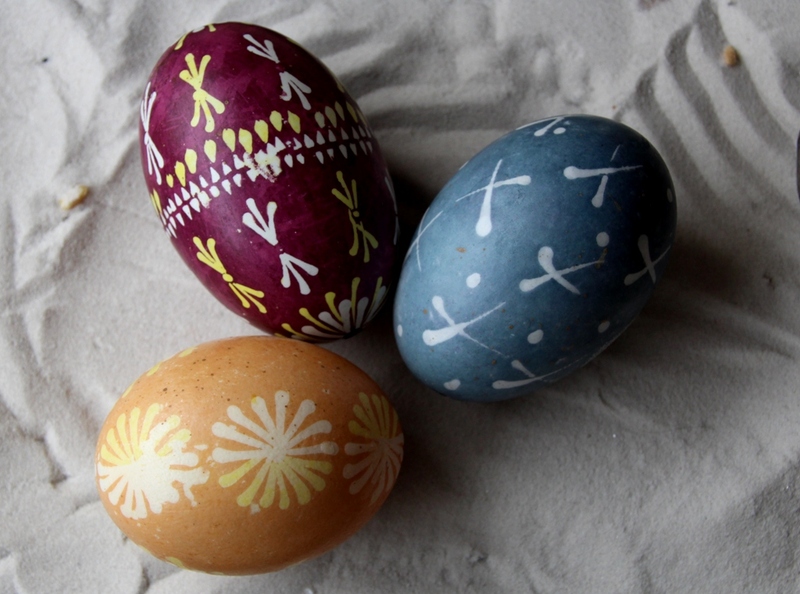 Katja will be showing people how to decorate eggs in the traditional German fashion and experimenting with natural dyes from 10-12 AND we’ll have a bonfire AND a Catalonian onion feast(!). Good Times. This time last year we had no idea where we’d be now. We could have been scaling back operations and becoming totally volunteer led instead we’re storming into the new season with metaphorical guns blazing! In the past month we’ve had about 40 people a week at our open volunteering days which is incredible. I don’t know of any project as little as ours that is so buzzing with people. Thank you every one and here’s to plenty more years growing together! See you in the egg-decorating-onion-eating-newt-watching-garden! P.S There’s still some spaces left on our Golden Adventure Days on the 8th and 15th. 6-12 years olds can expect to step into Sherwood forest spending the day with Robin Hood and his trust Badger friends, make bow and arrows, overcome adversity, thwart the evil Sheriff of Nottingham, and eat pizza. This entry was posted in News from the Garden on April 2, 2014 by GHCG.